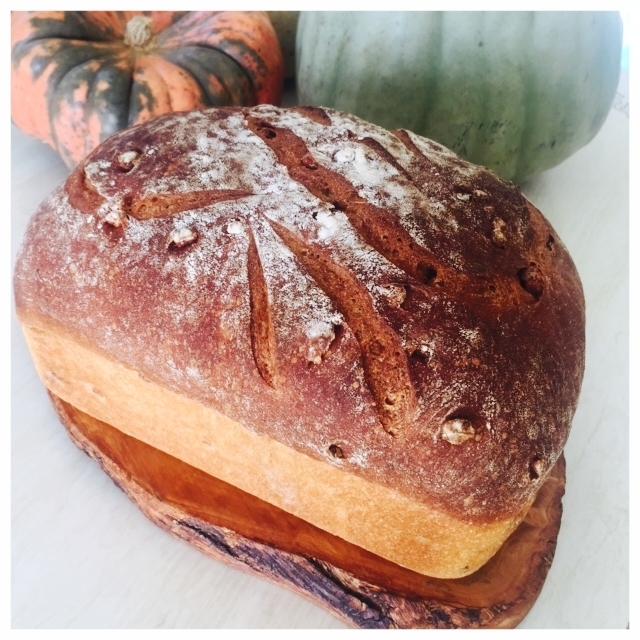 Seed bread recipe from the Full Moon Baking Club, just in time for Spring gatherings. For the April 2019 Full Moon bread I can’t think of anything more appropriate than recipe that includes seeds. We are officially in the season of Spring and maintaining with that earthy alignment, seeds seem like a must! Now is the time of year we get back to our gardens and nurture beginnings. No matter if you are embarking on a new phase of life (hashtag me) or a legit garden landscape, seeds are the homies of the season. And if you are someone that wants to adopt a homemade bread practice, well my friend… you have joined at the right time! Baking culture has unfortunately intimidated the newbies, keeping many would be bread bakers away from the craft. All the more reason for you to hike up your sleeves and shove that elitism right back to were it came from. Anyone with an oven can bake bread and as I explained in last month’s post, basic bread baking is accessible to all. Don’t fear the mess! That’s the meditation of having a bread practice. When you allow yourself to delve into the tactile art of dough, you forfeit your control and learn to work with what’s at hand. Literally. Cause this stuff will stick to your hands until you connect the relationship between wet and dry ingredients. Think back to your childhood when making mud patties where all the rage. Those were fun times until our parent got their say. Well, bread making is mud patty version for adulting. Age has most likely moved us away from play but according to research, play is an important part of development. And since we never truly stop developing, play should not be exclusive to children. If anything, we grown-ups need more exploratory activities to challenge ours brains and remind us that there is more to the world than what we currently know. And the more we learn to engage with the world around us, the better we feel navigating foreign territory. Longs story short, bread yo! Consider it a playground for curiosity that produces better and better results as you gain familiarity. So, back to the seeds… Aside from the obvious spring seeds blah, blah, this recipe will get your hands into the mix with the chance to really feel your way through the process. Like, really feel the dough and connect with that wet/dry relationship so that the concept starts to click. I’m also going to walk you through an overnight rise so you can familiarize yourself with the convenience of making bread on your own clock. Speaking of clocks, this is the part where I remind you that you do not need to bake bread on the Full Moon. The point of the club is to make a bread this moon cycle and call all your peops over for some sharing. You gotta make bread in order to break bread and whether you see this as a religious/Eucharist offering or just a standard good time among friends, we have reached a point in which opportunities for togetherness are few and far between, so lets make some bread. It doesn’t have to be this one. It doesn’t even have to be good. The point is you yourself are giving reason to gather and from there we can embark on strengthening our relationships and build better communities. Lofty goal? Sure. But we gotta figure out way to push back again all the hate and as Brene Brown says in her book Braving The Wilderness, “People are hard to hate close-up. Move in.” Granted, that is often easier said than done but that’s why you start with friends and create a reason to gather. Bread is the impetus. It’s the commonality amid our diversity and a chance to find connection with a stranger. Baby steps my friends… Just play around with the new… Just plant a seed and I promise you that growth will follow. In a large bowl mix the flour, salt, and yeast together. Add the warm water and mix to form a shaggy dough ball. Cover with plastic wrap and let rest 8 to 12 hours or overnight. Remove the cover and you'll notice the dough swelled and now appears quite wet and sticky. Sprinkle a layer of seed over the surface of the dough, and then with a wet hand, reach in and lift the dough from the bottom and fold it onto the top. Rotate the bowl slightly and continue with a wet hand to fold the dough over, hiding the seeds within. Do this until all the seeds are now on the inside of the dough. Next, add another light layer of seeds to the top surface and repeat the process of folding the seed into the dough. This method makes for easy kneeding of high hydration doughs while incorporating the seeds at the same time. Once the seed are folded thoughout, you can then shape the dough on a lightly floured surface. Shape the dough into a smooth round form, and then place the dough on a piece or parchment paper resting in pie pan. Sprinkle the last of the seed on top of the dough and then cover and let rest for an hour or until double in size. Preheat your oven and the empty Dutch Oven to 450 degrees F.
Once it's preheated to temp, remove the cover from the dough and score the top. Then remove the Dutch Oven from the oven and carefully transfer the dough with the parchment paper and place it into the Dutch Oven securing the lid on top. Bake the dough for 30 minutes. Remove the lid and lower the temperature to 415 degrees F. and bake for 10-15 more minutes until the crust is a deep golden brown. Remove the bread and cool on a wire rack. Basic bread recipe from the Full Moon Baking Club, made utilizing the dutch oven baking technique. Calling all makers, gatherers, and aspiring bakers! It brings me joy to write this to you on March 21st celebrating the Full Moon and also, the Vernal Equinox. This auspicious alignment provides some clarity around my why for this club, which gets me to the why of this recipe. You ready? Thus far, I have been making things up as I go. I had the idea for the Full Moon Baking Club as a way to bring folks together, break bread honoring it as a community tradition, as well as to archive my own baking pursuits. I was doing the whole Instagram Live thing but honestly, it’s wasn’t quite working in the way I had I hoped. As much as I thought it would feel like a “hang-out” it didn’t and started giving me unnecessary stress. The purpose of the “club" should really be a reason to gather your friends together and enjoy their company. Now, that might include the baking process, however I think the real gift of this club is in the eating. So, with it now officially being the start of Spring, I thought there’s no better time to plant some seeds of intention. My goal now is to provide you with a baking recipe on every full moon so that you can call-up your crew, invite them over, and offer them something wholesome and handmade. The fun comes from the togetherness and homemade goodies makes those moments all the better. To great surprise, it was easy! My first few loaves where meh… Some were dense. Others were dry. But shortly after I started my pursuits of bread making, things kinda clicked. It didn’t take long to realize that to make bread you just need a basic formula. There are endless bread recipes out there but at their core they are mostly the same. So this month, I’m skipping all the fancy and giving you this basic bread recipe. Place all the dry ingredients in a large bowl. Add in the warm water. Mix to combine so a dough begings to form. Form it into a rough ball and then turn out onto a lightly floured surface. Gather the dough together and knead it for 10 minutes(maybe more) until the dough is smooth and pliable and all the ingredients are well incorporated. Shape it into a round ball and place it into a large oiled or greased bowl and cover with plastic wrap or a damp cloth to rise for an hour or until doubled in size. After the first rise, knead the dough again on a lightly floured surface for 5 or 10 more minutes adding flour if necessary to keep from sticking. Then shape the dough to suit your loaf pan. Oil or grease the loaf pan and lay the dough in it, cover it, and let it rest for another hour or until it doubles in size. Score the top of your loaf with a few slits or markings. Bake for 35-40 minutes or until the internal temperature reaches 185 degrees F.
When finished, carefully remove the bread from the pan and cool on a wire rack. Now here’s the thing when baking bread at home. You need to decide your cooking vessel. You can bake bread on the simplicity of a baking sheet if you don’t have a loaf pan. However, a loaf pan in nice because as the dough rises during the second rise, it rises up. This makes for that traditional sandwich bread shape, instead of out which tends to happen when using a baking sheet. Both methods work so don’t get hung-up on having the right equipment. Just start getting into a habit of making your own bread and you’ll discover the things you want to enhance your hobby. One investment when you’re ready, is a dutch oven. It’s easily used for all kinds of cooking endeavors and also makes fantastic bread! Dutch oven bread baking helps to trap moisture during the baking process which lends itself to the most amazing crust. If you already have one, you are in luck! Follow the above recipe through Step 7 then skip to the steps below. Shape the dough into a round shape and place on a piece of parchment paper and set it into a pie pan. Cover and let rest for an hour or until doubled in size. Preheat your oven with the dutch oven inside to 450 degrees F.
When it's up to tempurature, carefully remove the dutch oven and set the lid to the side. Score your dough and then carefully lift the dough by the parchment paper and transfer the whole thing into the hot dutch oven. Secure the lid and place it in the oven to bake for 30 minutes. After 30 minutes, remove the lid and lower the temperature to 415 degrees F and continue baking for an additional 15 minutes or the internal tempurature reached 185 degrees F.
When finished cooking, remove the bread from the dutch oven and cool on a wire rack. So that’s your basic bread recipe. You just need flour, yeast, and salt. Yeast tends to be an ingredient that holds wannabe bakers back, so just seek some out and keep it in the fridge. Once you have the basics of bread baking down you soon realize that pizza on a whim are possible and so much more. Go forth and bake! And have fun sharing it with friends cause, sharing is caring! Happy Full Moon and Spring Equinox! I’ll be back next month with a seed bread of some kind Seeds seem very springs. If you have any seed suggestions let me know. I’m going to be searching all the seedy-bread inspiration in preparation. Let me know if you have any favorites. How to Feed a Senior is a participant in the Amazon Services LLC Associates Program, which is an affiliate advertising program. If you choose to purchase items after clicking on the links above, I will earn a small commission at no extra cost to you. Thank you for your support! Handmade flour tortilla recipe from the Full Moon Baking Club, February 2019. I’m trying to ease back into all the things after my father’s passing and that includes the Full Moon Baking Club. There is really no better way to make that happen than with a good friend. To be honest, that’s what this baking club is for. Gathering friends, attempting kitchen crafts and ideally eating said crafts with good company. As much as I believe in breaking bread and the power of sharing food to foster togetherness, this was the first month in which I have been able to participate in that vision. Lucky for me (and us) I happen to know one of the best handmade flour tortilla makers this side of the border. He happily shared his recipe, technique, and personal counsel for an epic night of tacos. It was a true reminder that no matter life’s circumstances, good times still await us. We just need to make the time. Speaking of time, hand making tortillas takes some… Individually rolling out 15 to 20 small pieces of dough is a workout so I suggest enlisting a friend (duh…) to help with the pan frying. You’ll find a rhythm and have fun in the process. And I mentioned the tacos, right? Just make the tortillas. Surely you know how to apply the fixin’s. Check below for the recipe and some step-by-step visuals. Add in the butter and cut it into the flour until you roughly have pea sized pieces throughout. Knead the dough on the counter until the ingredients are well combined and the dough is smooth and well formed. Then cut the dough into 15 or 20 individual pieces and form into small balls roughly the size of a golf ball. Place them on a plate, cover, and let them rest for 20 minutes. Warm a dry skillet over medium-high and let it heat all the way through. Without using oil, dry fry the tortillas on each side, turning after bubbles forms in the dough. Do them one at a time. As you get a feel for the timing you can start to roll the next tortilla out as the previous one is frying. Just be sure to keep and eye on your pan and flip them before burning. Pork tacos with roasted poblano peppers, arugula, avocado, and fresh papaya salsa with handmade flour tortillas. These were 100% worth it. Good luck and let me know if you make these tortillas! With the November 2018 full moon falling the day after Thanksgiving, cranberry sauce was begging to be a signature ingredient for the Full Moon Baking Club. Every year I make a cranberry sauce and every year I have leftovers. So this year, I made sauce with a plan. One of my favorite bakeries, Pain D’Avignon in Hyannis, MA makes these delicious cranberry-pecan rolls so I wanted a cranberry sauce that could steer me in that direction. I made this cranberry sauce using some during my Thanksgiving meal and the rest in this bread. It used walnuts instead of pecans but… close enough. My goal was texture. Speaking of texture, I baked this bread in a dutch oven because it makes a world of difference when it comes to the crust. If you want that crispy/chewy/artisan bread effect at home, bake your breads in a dutch oven. The lid helps trap moisture and produces steam while baking. That humid baking environment, matched with high heat equals crusty loaves that mimic professional bakery results. It’s one of the simplest answers to creating rustic breads in an everyday home kitchen. If you find yourself needing a dutch oven, I recommend the one linked below made by Lodge Cast Iron. 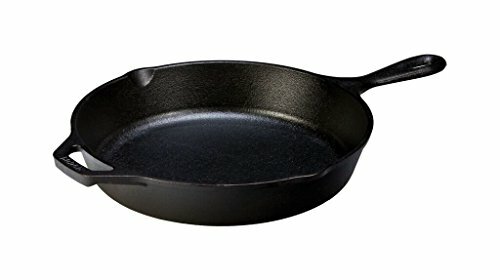 There are a lot on the market, some quite a bit more expansive than others but I prefer this one because it’s affordable, comes pre-seasoned and is made entirely of cast iron. Some have nobs on the lids with a lower heat tolerance than the pot which can throw off one’s cooking plan. Whatever style you prefer, just make sure it’s safe for high temperatures. You’ll need it to handle temperatures of at least 450 degrees for breads. I forgot to take pictures of the bread in progress so hopefully you checked-out the video when it was all going down on Instagram The high was making pink dough. The low was a mild panic where it suddenly occurred to me I was making a fruit cake. Otherwise, you didn’t miss much. I did however snag a few shots of the cranberry sauce in the works. Also, if you need a holiday gift, this mixing spoon and several others are still available. In a bowl mix together the water and cranberry sauce. Add the yeast and let it disolve. In a separate, large bowl, stir together the four and salt. Pour the cranberry mixture into the bowl with the flour and mix to combine. Mix the ingredients together helping to form the dough. Gently form the dough in the bowl, then turn it out onto a floured surface. Knead the dough on the counter for at least 10 minutes, adding more flour as necessary to keep it from sticking. The dough should become smooth and springy with all ingredients throughoughly combined. Keep kneading if feeling unsure about the consistancy. It's practically impossible to over-knead dough by hand and if anything, more kneading will only improve the texture. Once well formed, shape it into a ball and place in an oiled bowl, cover it, and let it rest/rise for an hour or until doubled in size. Once doubled, knead it again for another 10ish minutes, dusting with flour to keep it from sticking if necessary. Let it rise for another hour or until doubled in size. Preheat the oven and your dutch oven to 450 degrees F.
When the dough is ready, carefully transfer the parchment paper with the dough into the dutch oven. Cover with the lid and bake for 25 minutes. Next, remove the lid and reduce the temperature to 410 degrees F. Bake for 15 more minutes or until the inside temperature reaches 190 degrees F.
Cool on a rack for 20ish minutes before slicing. Ok folks, we got two weeks! The holiday and the Full Moon Baking Club countdowns are on so lets role with the festive and make Eggnog Bread! Do people even like eggnog? Probably not, yet somehow it winds up in the fridge every year. Well, this year we are gonna use it up! Eggs, milk and sugar can make for a tasty loaf so let’s just do it and embrace the holiday spirit. And since the full moon is on the 22nd of December, we can count on some leftovers to make holiday french toast. See you in a couple of weeks! And if you made it this far and have no idea what the Full Moon Baking Club is click here, catch-up, and join us on the 22nd! Sorry for the delay! It took a whole month for me to get this posted here but I promise to do better moving forward. My goal is to have the recipe posted before the coming new moon, giving ample time for all to get their bake on! It also gives me a deadline to work towards. The Full Moon Baking Club is part baking creativity and part time tracking. It’s all in effort to account for the slipping of time. And slip it does!!! Most days I have no idea where time goes but at least this monthly infusion of bread baking will hold a mirror up to the hours. I also want to thank those of you that joined me. I loved seeing your breads and breaking them with you! In a large bowl, mix together the squash, maple syrup, and yeast. Add the flour, salt, water and walnuts. Mix to combine so the dough starts to come together. Place the dough in an oiled bowl, cover and let rise for 1 hour. After the first rise, knead the dough again on a floured surface and then place it into an oiled loaf pan. Cover and let rise for another hour. Bake for 35-45 minutes and then cool on a wire rack. Freshly baked and sliced Squash + Maple + Walnut Loaf from the 2018 October launch of the Full Moon Baking Club. Here’s the thing about homemade bread… It’s great fresh from the oven. Seriously, nothing compares. But later in the week it tends to lose its appeal. The hack for that is heat! You can wrap it in foil with a sprinkle of water and the heat plus moisture will help revive that freshness. Or you can do what I typically do which is make lots of grilled cheese type sandwiches, panzanella salads, and eggs-in-a-hole. 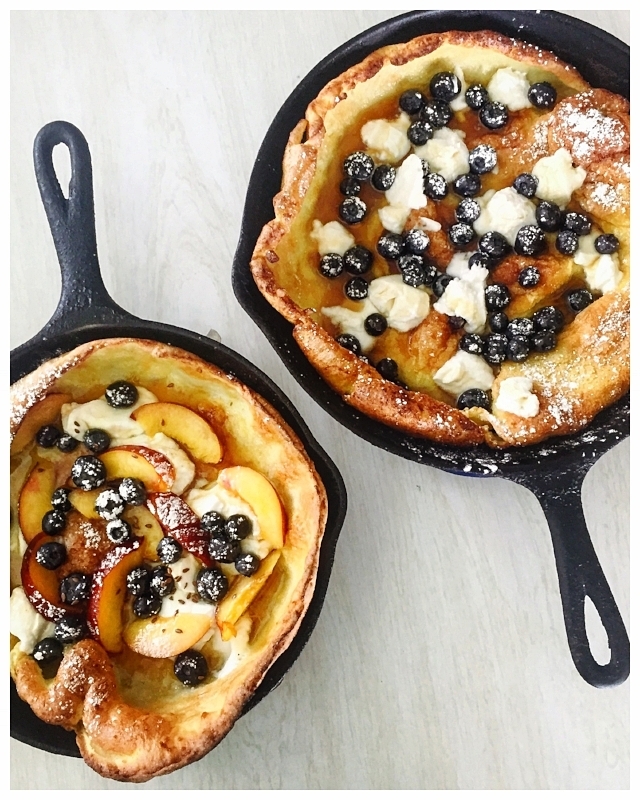 There’s nothing like a hot skillet to bring dead bread back to life! 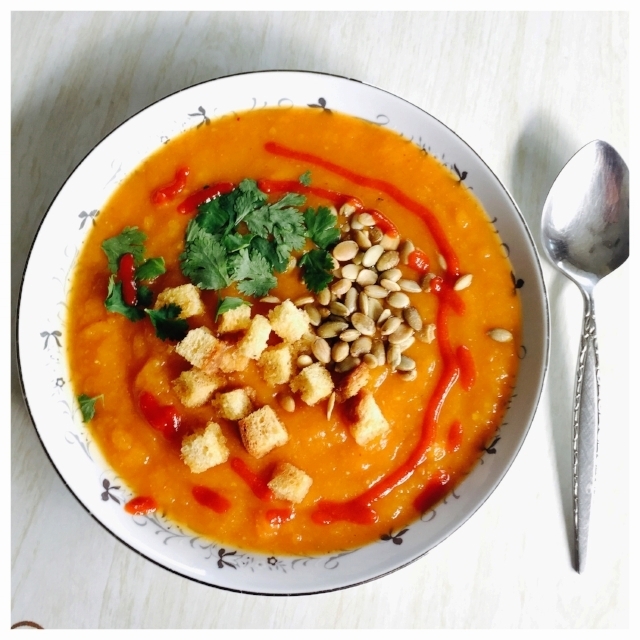 Pumpkin soup recipe with red curry and miso paste. If you need a little something different for your Thanksgiving spread, you can try this red curry-miso pumpkin soup. I know red curry and miso don’t exactly conjure-up the traditional flavors of the holiday but that’s all the more reason to try this recipe, especially if you’ll be appearing at assorted Friendsgiving events. The pumpkin keeps it “on theme” while dodging any chance at “more of the same”. And miso and red curry paste both pair well with squash. Why not shoot for “progressively” traditional this year as a way to build bridges at your Thanksgiving table? In a large pot, saute the onion and carrots together for a few minutes until the onion starts to soften. Add the Thai Red Curry Paste and mix to combine. Slowly add the broth, deglazing the bottom of the pot in the process. Let cook until the sweet potatoes are soft and cooked all the way through. Squeeze a wedge of lime and stir it in for taste. Add water if necessary to thin the soup to your desired consistancy. Remove a cup or so of soup and disolve the miso paste in it, then return it the pot and stir to combine. Serve immediately in bowls and garnish with cilantro, croutons, pepitas and sriracha if using. If you know me or have been following here for a while then you know I’m not one for accuracy or measurements when it comes to cooking. I’m about flavor! I’m intentionally working to better document my recipes as I know that they can be helpful to others. However, a recipe can often feel restricting, stunting the creative process when one assumes they don’t have all the necessary ingredients to make a dish. Dismiss that hesitation and lean-in. If you look at recipes and consider them as flavor profiles instead of how-to guides, you’ll discover your inner chef. The recipe above is actually inspired by this dish from Heidi Swanson’s cookbook Super Natural Every Day. It looks quite a bit different, but it’s kinda the same. I substituted sweet potatoes for the new potatoes which then prompted a switch from lemon juice to lime juice. I skipped the tofu and kale all together but for the most part, the ingredients are much the same. The big difference is the original recipe is like a salad, whereas mine is a soup! Once you understand which foods and flavors work well together, you can begin to craft original recipes. In my opinion, this is what takes your from being a cook to becoming a chef. Techniques can be taught but melding flavors together is an art. Much like a painter that combines colors to create new colors, a flavor profile is derived from depth. It’s one thing building on another to produce taste which helps define your palate. If you let the seasonal produce be your guide and flavor combinations develop your palate, you’ll discover new ways to assemble meals, even in a pinch! Good luck, get creative, and enjoy the craft of cooking! The winter squash varieties I currently have sitting on my kitchen table. If you like winter squash than you might want to get in on this seasonal bingo game. You don’t need to be a senior to love Bingo but you do need to love winter squash cause we are going to be eating a lot! Social media makes it easier than ever to connect with people however, our connections are careening towards divisions and we are losing site of our sense of togetherness. Winter Squash Bingo is a way for us to come together over food and form a community with a modern twist. I know it’s bold to assume that 24 winter squash varieties can bring us together but hey, we gotta start somewhere. Are you ready to get seasonal? You can download your board right here and cook your way through the season. The game will run throughout the Fall and Winter until all prizes have been claimed or until we reach the spring equinox on March 20th, 2019. Cook, make, or create recipes/meals utilizing a single winter squash per dish. Photograph your squash dish, tag @howtofeedasenior and use the assigned squash hashtag when posting on Instagram. Participants should send a Direct Message to @howtofeedasenior when they have achieved Winter Squash Bingo along with a photo of their Bingo board to confirm their prize. I know not everyone is an Instagram user but unfortunately, that is the only way I am able to verify participation for prizes. That being said, don’t let that keep you from participating on your own way. If Instagram is not your thing, create your own challenge and your own rules with friends, family, colleagues or whomever that’s conducive to your own version of fun. My goal with this game was to create something that could connect us across the backdrop of our differences no matter one’s age, gender, race or region. The regional availability of all these squash varieties will be interesting in an of itself, relative to trade and how agriculture influences our access to nutrition. Are there squash deserts? Are you in one? We’ll explore “together” as we make our way through grocery stores, farmer’s markets, and backyard gardens hunting for the most allusive ones. And in case you’re already lost, you can check-out this a fairly comprehensive guide to winter squash varieties that might be helpful when getting started. As for full disclosure I will tell you that I am playing this game too! Not for the prizes obviously, but for the sake of curiosity. I personally love the versatility of winter squash and its ability to cross age related dietary concerns. It can be roasted, pureed, baked, you name it! A food for every age. That’s also where the hashtags will be handy. A quick hashtag search will show what others have done with their squash of that same variety, which over time will lend itself to a collection of squash inspirations. This again will help aid that sense of community as together we can help each other cook, make and create recipes in an effort to come together around the thing that’s been proven time and time again. Food! 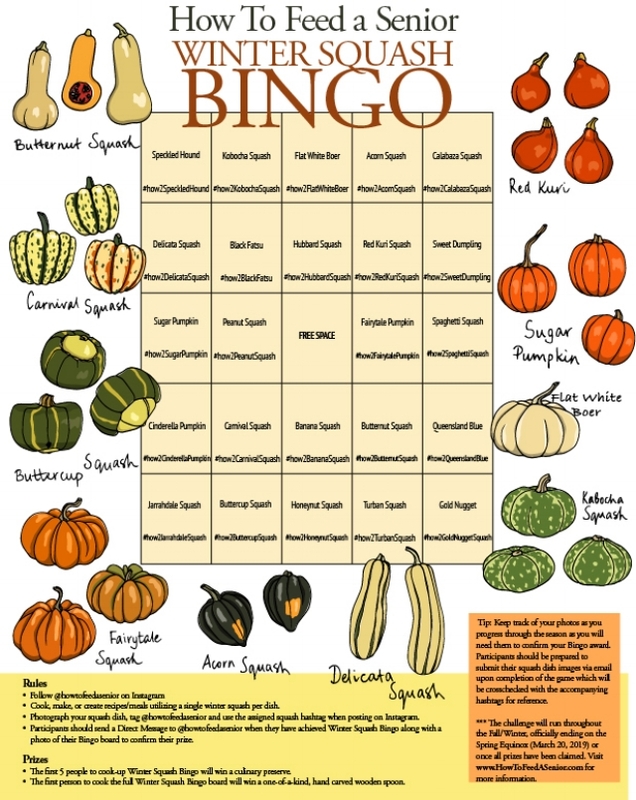 And don’t forget your Winter Squash Bingo board. 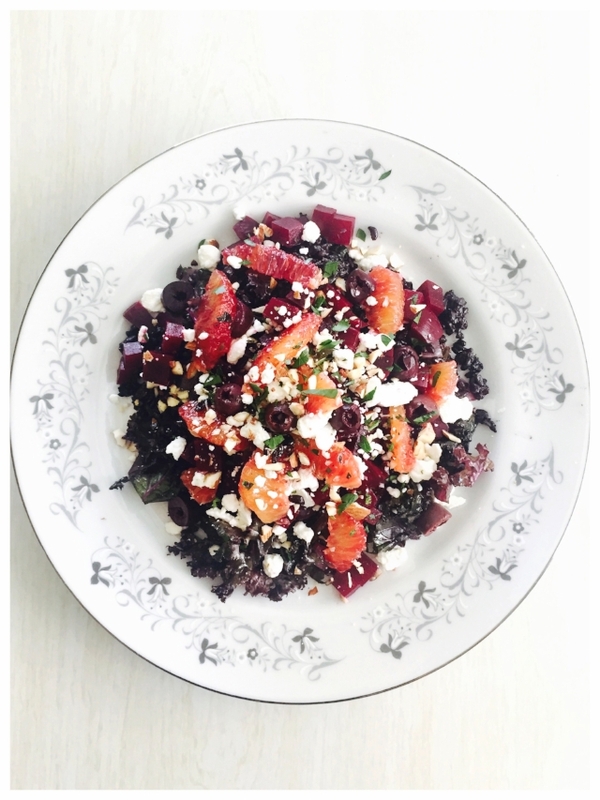 Halloween salad with black rice, purple kale, red beets, goat cheese and blood oranges… I call it The Black Widow! Get your festive on with this healthy Halloween salad made with black rice and blood oranges and a few other ingredients that keep to the holiday theme. While the kids (and seniors) might be game for a full night of candy, us caregiver need that nourishment to survive a night of horrors. Eat this salad, then hit the candy and feel a little better about your life choices come morning. Rub some oil into the kale leaves and roast in the oven if you want it crispy (I'm a fan personally but this step is not necessary). In a bowl, mix the kale and rice together in your desired proportions. Place a serving of the rice mix on a plate. Top with your beets and black olives. Top with a little parsly and the vinegar basad dressing of your choice. And if you’d like an additional fright, you can enjoy these photos of my dad and I last year on Halloween. As for what we dressed as, I referred to our costumes merely as “dressed-up” but as soon as we hit the streets folks kept referencing my dad as William H. Macy’s character, Frank Gallagher from the show Shameless! Hey… Why not right? Leftover french fries get an upgrade with this Thai Red Curry Poutine recipe. I made this Thai Red Curry Poutine a few weeks back sparking lots of interest in a recipe. I was kinda making it up as I went, throwing stuff together somewhat haphazardly. At the time I was only thinking about how best to stuff my face with some left-over french fries that were hanging in my fridge so my how-to specifics here are a bit vague. When I posted this on social medial many of you asked about a recipe so I thought I should try and write one out. Granted, I'm going off memory here so measurements might be a bit wonky but more importantly, this is the type of dish you can gauge more on appearance. If the gravy is too thick, add more coconut milk. If it's looking too soupy, let it simmer down. This gorge-fest is a far cry from rocket science. You can wing it. Have faith! In a pan sauté the white parts of the green onions with the red curry paste. Once the meat is kinda cooked and broken up, stir in 1/2ish the can of coconut milk and simmer lightly. You want to cook it down so it thickens into a "gravy". Add more or less coconut milk if necessary. You can also add more curry paste if you need to. After heating your fries (or baked potato?) top with the "gravy" and the cheese and melt it in the oven. After heating it up, remove from the oven and add the green onion tops,fresh cilantro, dollop of sour cream (or yogurt) and then squeeze with fresh lime. If I had any sense about me I would have topped this all off with some runny-yolked egg and called it breakfast but you know... Still good! And for anyone in need of council, I'm here for you. Like I said, my measurement are roughly a guess at good estimates so let me know how it goes if you make this, which you should probably plan to do ASAP. Enjoy! Ham and cheese strata with a little parsley on top. With Spring holidays approaching here's a simple recipe you can create with some left-overs. This ham and cheese strata is pretty basic. Nothing fancy. These items just happen to be the things our house tends to have on hand after Easter dinner. You can substitute other ingredients too. Peppers, onions and other watery-type vegetables are best sauteed first so they release their moisture prior to baking but for the most part feel free to use whatever. Combine eggs and milk in a bowl and add your biscuit/bread and give it a good coat. Let it sit in the fridge overnight soaking up the egg mixture. Pour out into a buttered, oven safe baking dish. If the mix appears dry, with no excess egg mixture add more, whipping another egg or two with a splash of milk. Pour that over the top of your strata mix where it will pool at the edges. Bake at 350 degrees F for 40 or so minutes until the strata puffs slightly and the center is cooked through. Sweet potato, pumpkin and apple soup topped with blue cheese crumbles, pomegranate seeds, and pepitas with a little bit of fresh thyme. What’s the difference between a cook and a chef? This was a question an old kitchen colleague and I were having when he stated quite frankly that a chef is “creative”. I thought we were going to banter about ideas of technique or execution or knowledge of basic sauces but nope. Just creativity! Apparently, those other things can be taught. Cooks can follow directions but that doesn’t mean a cook can necessarily create. Creativity requires vision and a chef always has a vision. I’m sure that theory is largely debatable but it’s good enough for me! I’m not much of a recipe chef. I love a good cookbook but honestly, it’s the pictures that inspire me. A photo and a list of ingredients is often enough to get the gears turning and that’s when the fun begins. And since we are on the topic of cookbooks, I want to introduce you to two of my favorites. The Flavor Bibles! They aren't exactly cookbooks in the traditional sense, and they definitely aren’t full of picture, however, these books serve as a reference for food items that pair well together. They are a great place to start when building a “flavor profile”. 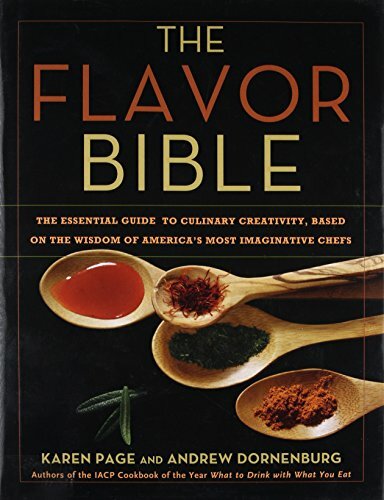 A place where your inner chef can start to develop it vision… The Flavor Bibles, one of which is vegetarian, are books that basically allow you to cross reference ingredients to find flavors that work well together so you can construct you own vision using complimentary ingredients. Below I've included Amazon affiliate links if you are interested. Both books, minus their jacket covers. They both are wonderful and if you are looking to inspire creativity in your kitchen these books are a great place to start. Again, these are not recipe books. These are reference books to help you develop a foundation for tasty meals. For example, say you have a head of cauliflower in the fridge and you are wondering what you can add to make it into a full meal. Well, flip the book open to cauliflower and there you will find a list of ingredients that go well with cauliflower. It includes herbs, spices, vegetables, and meat items (assuming you don't have the vegetarian book) that are known to pair well with cauliflower. You can then compare the list to items you have in your fridge or pantry and begin constructing your meal. As you gather the ingredients you start to have a better feel of what you can make. Next thing you know, boom! You just just chefed! I don't like following directions but I still appreciate guidance and these books allow me to develop my own style. They have become the backbone of my kitchen and I'm sharing them because I love them and I think budding chefs and the gourmet crowd would love them as well. Ok, and now back to this holiday soup recipe. It's sweet potato, pumpkin, and apple soup topped with blue cheese crumbles, pomegranate seeds, pepitas and a little fresh thyme. According to the Flavor Bible all these items paired well together and, well... let's just say after my bowl, I agree! Sauté the onion in a pot with a little oil until it begins to soften. Add the sweet potato, pumpkin apple and the vegetable broth. Bring to a low boil and cook for 15 minutes or until the potatoes are soft. Once pureed add the water to thin the soup. You can add as much as necessary to reach your desired consistency. Squeeze the lemon wedge into the soup and add salt and pepper to taste. * This page contains two Amazon affiliate links. If you click on an affiliate link and make a purchase, I will earn a commission at no extra cost to you. This helps maintain the cost of How To Feed A Senior. Thank you for your support. Pumpkin hand pies with fresh whip cream. Nothing says Thanksgiving like pumpkin pie with fresh whip cream, but why not give the traditional recipe a holiday boost by making pumpkin hand pies? 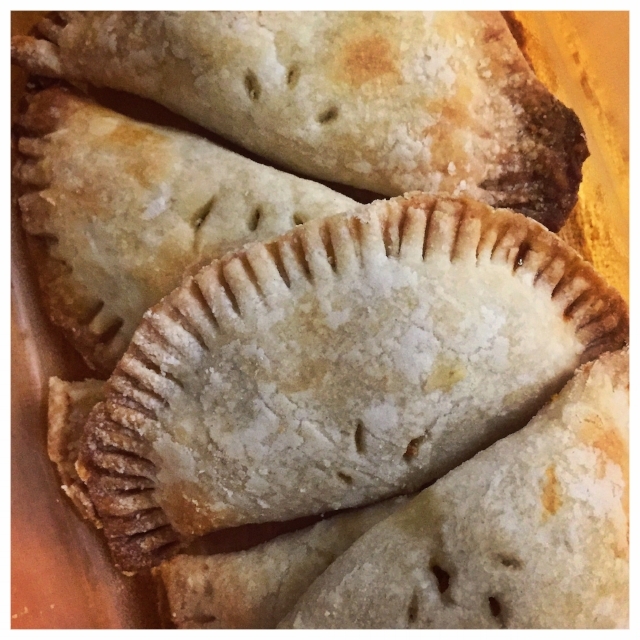 Hand pies make life easier when it comes to clean-up. No plates, no forks, no knives to messy up when slicing. Just a grab and go snack to help celebrate the season. And just in case you need a little soundtrack for inspiration, allow me to introduce you this gem! Debi Smith and Doc Watson actually have a song called “Pie”. Ugh… ok! Don’t ask how I came across this but it couldn't be more fitting, especially if we are talking about my Dad. It’s difficult at times posting recipes because he is increasingly picky and often refuses to eat what I make. But... not when it comes to hand pies! I'm honestly not surprised given his tendency towards sweets and their hand-held convenience. As his dementia's been worsening, he's slowly losing his mobility and competency with utensils. As for making these pies, just know you have options. I used this recipe for the dough. It utilizes cream cheese which compliments pumpkin but also contributed to a soft pastry crust that I knew would be easily eaten. As with many seniors, aging teeth or dentures can be a real deterrent when it comes to food so the softer the better. You can however use store bought crust if you are short on time or seek out a basic pie crust recipe. Like I said, you have options! As for the filling... I roasted a Fairytale Pumpkin earlier in the week and wanted to use it up. You can absolutely use canned pumpkin which might allow you to skip over pre-baking the filling (see below). Using the fresh pumpkin was much too runny in my case and if it's too wet, it will damage the dough. Don't be afraid to bake the filling first if necessary. Roll out each circular cut-out to about 1/8 inch thickness and top one side with some filling. Wet the outer edges of the dough with a little water, fold over, and seal the edges by pressing down with a fork. Brush tops with an egg wash and poke a few holes to vent steam in each one. Bake at 375 degrees F for 20-40 minutes or until the dough becomes a golden brown. After baking, cool on a rack. When it comes to the fresh whip cream just add a teaspoon of vanilla extract and a teaspoon of powdered sugar to some heavy whipping cream and whip on high until stiff peaks form. Then dip the hand pies in it until your hearts content! It's exhausting to carry a heavy heart and never put it down. You start to wonder what it holds, examining which parts are disposable and unnecessary or even replaceable. Everything is becoming murky. Everything feels like a mix of tragedy and destruction in the wake of natural disasters, nuclear threats, terrorism, and politics. Its never felt like a more important time to rise to the occasion and stand up for what you believe. But what do you believe? We are all hurting. Circumstances aside, I think it's safe to say there is a collective hurt but now what?! I've been stewing in my own misfortune long enough to realize there is no rescue committee for your life and if you want to feel better you have to do better. There is no recipe or instruction book on how to pick-up the pieces. You just start picking them up. Put things together, create piles, salvage what you can and move on. There is no greater leader right now than you and there is no better time than now. Ready? These cinnamon rolls don't exactly represent my dietary belief in "how to feed a senior" but you know... Life is for living! Items like these gooey cinnamon rolls feed happiness and I think that's just as important as nutrition when it comes to living a good life. We need to indulge more in simple pleasures. That's been a real thing for me lately. Simple pleasures... I keep an eye out, trying to take note of when I happen upon one and I'm often surprised at their ubiquity. Sometimes observing one turns into a slew many and I feel a wave of gratitude for this "time" and that doesn't quite fit the stereotype of the caregiver demise. Caregiving can feel much like purgatory but I'm often taken aback at the moments I catch myself quite content with my baking, gardening, and crafting. I'm frequently bitter at all the moments this experience has stolen from me but its been long enough now that I've come to accept the terms. There's no going back to the days of what was. There's only forward. And in this march, I've grown deeper into my hobbies. This journey is cultivating skills that only come with time and for that I am grateful. Combine all the ingredients for the rolls into a large bowl and mix to combine. Add a dusting of extra flour as necessary to absorb moisture and work into a manageble dough ball. Turn dough ball out onto a floured surface and kneed for about 10 minutes adding flour as necessary to keep the dough from sticking. After the dough is well combined and you are done kneeding, lightly oil a large bowl and place the dough in it and give it a swirl so the dough has been lightly oiled. This will keep it from sticking to the bowl later. Cover the bowl and let rise for about 1 hour or until it's doubled in size. While the dough rises prep the frosting. Place all the frosting ingredients in a bowl and combine with a mixer till all ingredients are well incorporated (be careful not to over mix). In another small bowl combine the brown sugar and cinnamon for the filling and set aside. When the dough has doubled in size, dump it out onto a floured surface. Roll it out into a rectangular shape roughly 1/2 inch thick. Drizzle the melted butter on top and brush it to cover the top leaving an inch on all sides. Sprinkle the brown sugar/cinnamon mixture evenly over the buttered area. Starting with a long side, roll the dough up into a long dough snake (Dough snake? Is that a thing?). Cut the dough into 2 inch pieces, discarding the two end pieces that lack the filling. Place the rolls cut-sides up into a buttered pan, nestling them next to eachother but leaving room for them to rise more. Meanwhile begin preheating the oven to 375 F degree. After 30 minutes and the rolls have swollen in size, place in the oven and bake for 30-35ish minutes until the tops turn golden brown and the inside tempurature reaches 160 degrees F.
After baking scoop spoonfuls of the frosting on top while the rolls are hot. Wait a few minutes and let the frosting melt a little then spread it around the tops in sheer decadence. First you have to set the mood with this sound track I provided for you below. I suggest cracking a window and letting a fresh breeze roll in. It's officially spring and we're all probably long over due for a deep breath and an even longer exhale. In a heavy pot melt the butter. Saute the shallots with the thyme until they soften and begin to brown. Add the stock a little at a time, and mix it well. Then add the asparagus and bring the pot to low simmer. When the pot starts to simmer add the lemon juice (This will help retain the bright green color of the asparagus as it cooks). Simmer for about 10 minutes or so until the asparagus have softened and then blend with an emersion blender (or carefully in a blender after its cooled) until smooth. Stir in the cream and season with salt and pepper to taste. Serve and garnish with croutons, walnuts, asparagus, etc. You have creative license here! My dad pretty much runs the show around here and I'm getting quite the education on all forms of classic entertainment. Dean Martin has risen to the top! Mr. Martin and some good ol' Andy Griffith... Two guys I had no idea were after my own heart! Take two bowls and in one add all the wet ingredients and in the other add the dry. Mix both sepretly then combine. Carefully pour the batter into the bread pan (so as not to shift the rings) and bake for roughly 50 minutes until a toothpick inserted comes out clean. When finished baking, carefully remove the bread and cool on a cooling rack. Once cooled you can slice the dome off the "top" and invert the loaf so it rests easily with the celementine rings on full display. Open-face rainbow beet tartine with whipped ricotta cheese, watercress, toasted walnuts and honey. I am not sure why but lately, all I want is a lush veggie sandwich. This is rare. I'm not much into sandwiches. Unless of-course it's a breakfast version, in which case, I want them all! a generation of people, typically in their thirties or forties, responsible for bringing up their own children and for the care of their aging parents. Since I personally don't have children I am going to keep this sandy open-faced but you do what you have to do to make it right for you! Get yourself some bread and start building a good lunch. Surely, you're gonna need it to get through the next few years. Tartines with the crust cut off for my old man. Preheat the oved to 425 degrees F.
Remove any greens and clean the beets. Place in a baking dish and cover with foil. Prick the beets to test for doneness. Let cool completely then peel to remove the skins. While the beets cool, whip the ricotta and heaving whipping cream with a hand mixer until stiff peaks form. store in trhe fridge till ready to use. Butter the bread and griddle both sides in a skillet. Next you can really add that ricotta. I scooped it out with a spoon and flattened it some. Slice the golden beets and places the slices on top of the ricotta. Drizzle with a little honey. Add the toasted walnuts and a little fresh thyme and sea salt and it's ready to eat! PS- I made that spoon! Mahogany. My first since being in FL. 3 Cheese frittata with cauliflower and mushrooms. It seems like it has been weeks now since my dad has eaten anything other than bananas, ice cream, and peanut butter and jelly sandwiches. His teeth are so sensitive that no matter what I make, he's not interested and with each passing day I worry about his declining weight and lack of nutrition. I have been searching recipes high and low. Soups, purees, etc... He's just losing interest in eating and I'm losing confidence in my cooking. Insert this frittata and together we both stumble a few steps forward. Position an oven rack in the center of the overn and preheat to 357 degrees F.
Place the caulifower in a pot covered with water and boil for 4 to 5 minutes until it's soft but holds its form. Then strain and pat dry. While the caulifower is boiling, stir together the eggs, milk, mustard, and paprika in a large mixing bowl. Next, stir in all the ricotta and chives. Add half of the parmesan and mozzarella and mix well to thoroughly combine. On the stove-top, heat an oven-proof pan on medium-high and add the oil or butter. Saute the mushrooms until they brown and release their liquid. Add the cauliflower, to the mushrooms and continue to saute. Allow the cauliflower to brown, then add the egg mixture, patting down the cauliflower so it's evenly distributed without stiring up the bottom. Scatter the left-over parmesan and mozzarella cheese over top and place in the oven for 12-15 minutes until the center is set. Let cool for 2-3 minutes before slicing into wedges. Finally we have a food breakthrough. Hopefully there are a lot more recipes to come!